We saw an exotic and unusual submission in the main event of Fight 2 Win’s 100th event. Hawaiian black belt Tracey Goodell hit an armbar from the mount against Rita Gribben, but it wasn’t like we’re used to seeing. Appearing in a professional submission grappling event for the first time in her native Hawaii, Goodell enjoyed strong crowd support. 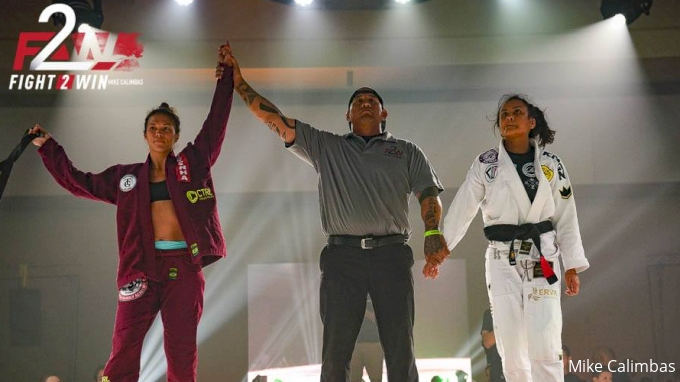 The 2018 Fight 2 Win female black belt of the year entered to strong crowd support and aggressively looked for subs early in the match. Capitalizing on a double guard pull to move right into mount, Goodell used her long legs to wrap up what was in effect a body triangle but from top mount. Gribben did her best to turn and escape, but Goodell rode the momentum and transitioned from mount to back, to guard and back to mount, never letting go of the triangle. The final sweep put her high on the body and into an unusual mounted triangle position but over the shoulders with with both arms inside – the position looked almost like a mounted dead orchard. Isolating an arm, Goodell forced the tap 3 mins and 45 seconds into the eight-minute match. She was watched from mat side by her three sons, who she immediately ran over and embraced. Goodell moves to 3-0 in Fight 2 Win and will return on Fight 2 Win 101 in Denver CO for a match against Vanessa Wexler. Watch it live or On Demand only on FloGrappling.